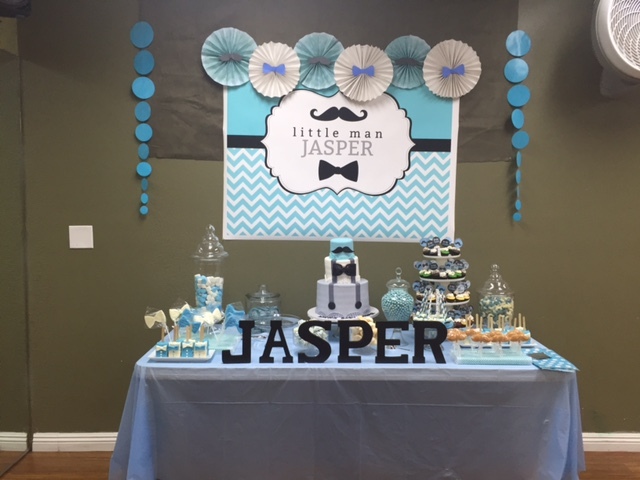 My customer Jenny sent in this photo of her little man Jasper’s celebration using our backdrop file. There are so many great ideas here for decorating your little man’s dessert table starting with all of the desserts I can see at the front of the table – so adorable! It’s always great to see matching theme colored desserts on the table, blue and white are ideal colors to work with because they tend to be readily available in major stores. Due to the popularity of a Little Man theme, there are also so many items you can now purchase now, so it makes it that much easier for you to get creative.